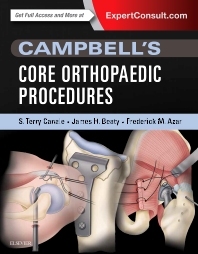 Ideal for orthopaedic surgeons who need a practical resource covering the top procedures in the field, Campbell’s Core Orthopaedic Procedures utilizes a succinct format that focuses solely on the surgical techniques critical in helping achieve optimal patient outcomes. Featuring step-by-step procedures used at the Campbell Clinic, this new resource offers practical, concise solutions for every patient scenario. Trusted techniques follow the format outlined in Campbell’s Operative Orthopaedics, 12th edition, accompanied by detailed illustrations, intraoperative photographs, and additional online video clips. Easily find information in the moment of need with a practical, portable, easily accessible volume featuring the most relevant procedures used at the Campbell Clinic. Covers procedures from all body regions presented in a concise atlas-style format that includes an Expert Consult eBook with image enhancements. Procedural steps lead with artwork and are followed by bulleted information so that techniques can be quickly reviewed.